As always, Artist’s Alley dominated the center of the main floor. 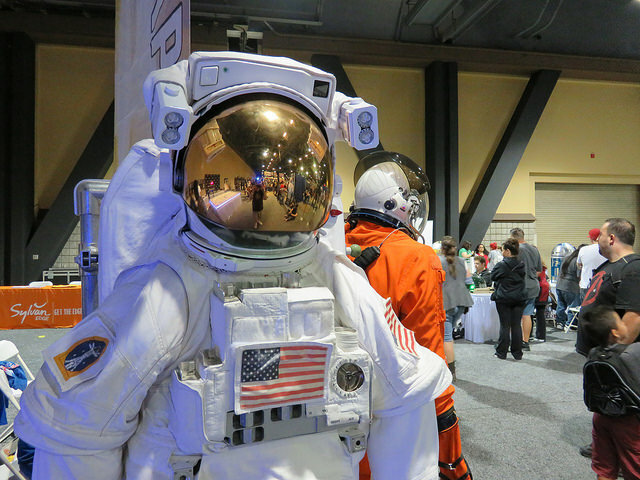 Space Expo was back, with space suits, a VR experience of some sort, and battle bots. Laser tag was waaay in the back, and there was a LEGO play area that I suspect I would have spent a lot of time at under the original plan. 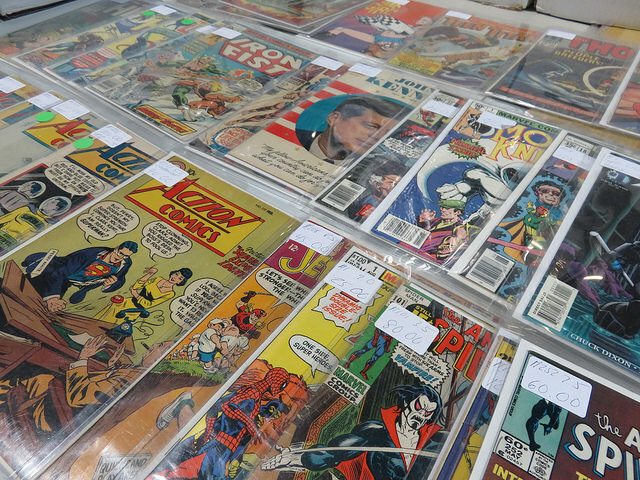 My main goal as far as comics creators was to meet artist Colleen Doran. 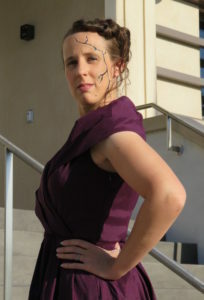 The last time I saw her at a con out here was was a decade ago at SDCC when Comic Book Tattoo was new. I bought a copy of the Book of Lost Souls collection and her biography of Stan Lee…and she told me to make sure to come back and catch Peter David (who wrote it) so I could get his autograph too. Somehow I hadn’t noticed he was going to be at the con. I also talked a bit with M.M. Chen, writer on Lady Mechanika. I had to admit that I hadn’t actually read the latest series, but it was on my to-read pile, and we commiserated about not having time for everything we want to read. I found artist Brett Booth as he started talk about redesigning Titans covers and costumes on short notice, but unfortunately I had to run to make it to the panel I wanted to catch…. This year the panels were held in the older part of the convention center, underneath the theater. It’s the part that I vaguely remember visiting for high school events and at least one fan convention I attended as a teenager. A narrow hallway and stair connected the lobby to the conference area, which worked out a lot better than having to walk all the way around the convention center like we did a few years ago. The Lawyers of Hell’s Kitchen. One could argue that vigilantism is super pro bono work. Two lawyers / comics fans from The Legal Geeks talked about Nelson & Murdock (Daredevil) and Jeri Hogarth (Jessica Jones), where the depiction of the legal system went right and wrong, and how quickly they would get disbarred. Some interesting discussions on how self-defense and defense of others fit into some of the fight scenes, whether the fact that Karen pauses during her encounter with Wesley changes the circumstances, how the legal system would deal with Kilgrave before and after his upgrade, what Fisk would be charged with, and so on. It wasn’t as fun as the zombie mock trial at WonderCon a few years back, but it was still really interesting. Last year I took all my photos with my phone because of problems with my camera. I have a new camera, and I used it most of the time. 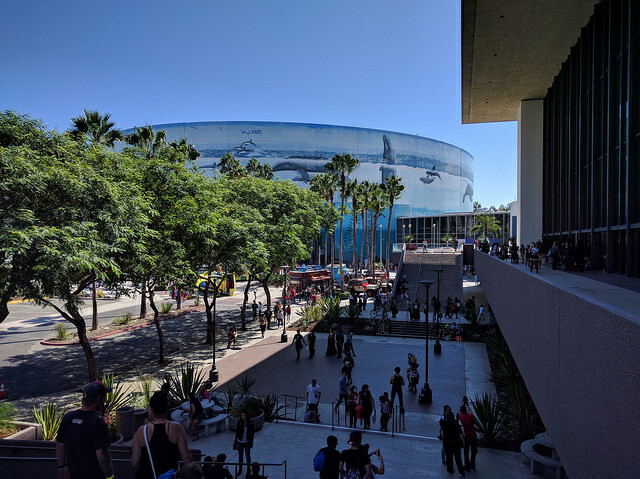 It did well in the convention hall, but I pulled out the phone for some of the outdoor shots, particularly scenes with mixed shadow and sunlight. Yay for built-in HDR! 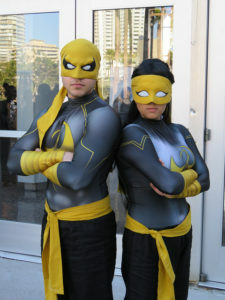 I always wonder: when people in formal wear show up for an event next to a comic convention, what do they think of it? A lot of people were lining up for something starting around the time the comic con closed, but I never found out what. Signs of some daytime event also surrounded the Rainbow Lagoon when I walked over to look: Temporary fences all over the place, hay bales arranged for seating, port-a-potties, and piles of ice emptied from coolers. I’m guessing it was part of the Long Beach Triathlon, based on the parking signs I noticed when I arrived, and the route going past it — though it doesn’t seem to be a starting or ending point from what I can tell. 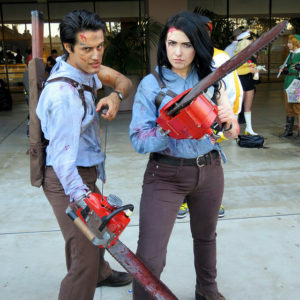 The last photo I took at the convention was of a couple who were both cosplaying as Ash from the Evil Dead movies. I found that strange as I drove home past an actual S-Mart. 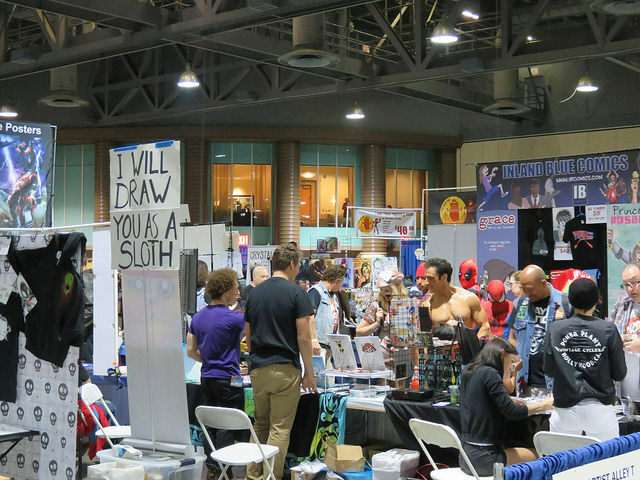 LBCC was held September 17-18, 2016. Check out my full photo gallery on Flickr.